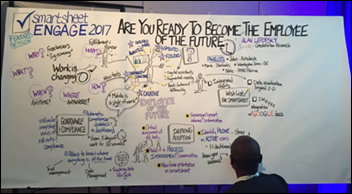 I took time out from consulting this week to attend the first-ever Smartsheet user conference, held in Seattle. I’ve been a user of Smartsheet for some time, primarily because it makes it easy to share project plans and documents with clients in a way that I can control without having to deal with versioning issues. I like the ways people can collaborate and it just feels easier to me to use than other Web-based collaboration tools. When I heard a few months ago that they decided to host a client conference, I jumped at the chance to see what it looks like when a company decides to make that happen. I’ve heard plenty of tales from the EHR world about clients who attended the first user group for a given vendor, many of which take the "bunch of guys and a couple of cases of beer" story form. I suspected Smartsheet had progressed well beyond that narrative based on the agenda, which included a wide variety of sessions and social events. The conference kicked off on Monday with a meet-and-greet at The Parlor in Bellevue, just a hop, skip, and a jump from the conference hotel. Pool tables and ping-pong competed for attention with Monday Night Football, along with a variety of snacks and drinks. For those of us who are perpetually jet lagged, it was a nice way to start a conference. The conference went into full swing on Tuesday with over 1,000 people in the audience for the keynote session. They brought in local DJ Darek Mazzone to introduce the crowd to the Seattle music scene and it definitely set the tone for the morning. Prior to the conference, I didn’t know anything about the company’s leadership, but found them engaging and passionate about the work they’re doing. Based on the staging and lighting budget, it was clear they had spared no expense in aiming for a first-class entry into the user conference space. The company used the event to launch several new features, some of which were literally rolled out immediately prior to the conference kickoff. I hadn’t been aware of their mobile app before they discussed it at the keynote (not sure how I missed that little tidbit) but quickly downloaded and started testing it. After the pumped-up buzz of the keynote, everyone headed out to breakout sessions. The halls were crowded, which was a testament to the sold-out status of the conference, which seemed a little large for its surroundings. The first few breaks between sessions were crowded with videographers trying to capture footage of the crowd along with client interviews. I took advantage of one of the breaks to talk to one of the mobile developers, who was very interested in hearing what users think of his product and who didn’t give me any sass about the fact that I didn’t even know it existed until a few hours prior. 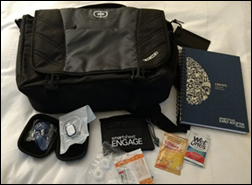 Breaks were also prime time to continue on the "swag journey," which drew participants to various booths highlighting different product features. 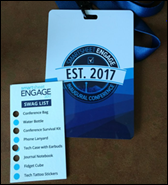 The swag was outstanding, with a high-quality messenger bag for everyone (although I was surprised that it didn’t have a Smartsheet logo). I bypassed some of it but did snag the conference survival kit with its band-aids and mints along with a tech case with some headphones that my teenage house-sitter will like. I took a pass on the fidget cube and tattoo stickers. The swag hunt punch-cards led to some jokes among attendees who had difficulty figuring out which booth had which swag (or whether a booth had swag at all) until they learned to "follow the hole punch crumbs." We’ll see if that gets changed out for next year. One conference element that I hope does get changed out is their preregistration and attendance scheme. Attendees had to preregister for sessions and then have their badges scanned for admittance to a session. If you were one of the unlucky attendees like me who didn’t receive the preregistration email, you had no idea you had to preregister for sessions, and were consigned to a second-class "standby" lane just outside the meeting room. Others who did preregister weren’t showing a green light when scanned, and were sent to the end of the standby line. The way it was handled at some sessions was less than customer-friendly, and I hoped that after a couple of rounds of this silliness the conference organizers would have tried something different. It continued throughout however, with room monitors ranging from just letting people in regardless of whether they scanned green or not, to being belligerent with attendees. I resigned myself to the standby line but was able to get into every session I wanted to attend. The bottom line though, is that for a company that talks a lot of about reducing wasted time and streamlining work, they added some major inconvenience (and dissatisfaction) for their attendees. Pro tip: Have people pre-register to get a feel for the room size you need for each session, then bump that by X percent and just let everyone in without a bunch of silly lines. Some sessions featured a sketch artist creating story boards during the sessions, which was fascinating to watch if you were lucky enough to get a seat in the front. My favorite session was one on collaborative work, led by Margo Visitacion of Forrester Research. She addressed a lot of issues that I cover in some of my change leadership courses, including helping people understand the new ways that work is done today and how knowledge workers operate compared to traditional work methods. My second favorite session featured Amy Sovereign from the City of Detroit discussing how their Program Management Office uses Smartsheet in their Lean Six Sigma efforts. The presentation format was more of a fireside chat, but with vibrant photos of the city projected on the big screen as they talked. They’ve done some interesting things with the technology including end-of-shift debriefing surveys when they deployed body cameras to the police department. She got several chuckles from the audience, talking about people who are "allergic to Lean Six Sigma" and how much people love their paper. I also enjoyed her comments about making sure that you have buy-in before deploying new solutions, because you "don’t want to put technology in a catapult." It’s vivid images like those that can captivate an audience. I was less-than-captivated by another session where the male panelist was introduced with all of his credentials and accomplishments, and the female panelist was introduced as "the lovely Miss Jane Doe." I’ve never heard a man in a professional setting introduced as "the handsome Mr. John Doe" so I’m not sure why that is acceptable, and I wasn’t the only person it grated on. This phenomenon has actually been studied before, and I would encourage presenters and moderators to take a gander at the paper before preparing your next set of introductions. The session was also marred by horrible feedback between the speakers and the microphones and a constant humming, so I didn’t get much out of it. Speaking of ruining the audience experience, I’m not sure why people still think it’s OK to answer phone calls in the middle of the session and talk all the way down the aisle and out the door. Nor do I understand why someone would do a conference call in the hallway on speakerphone and not with headphones, but I saw that at least twice. The lunch breaks were designed to be networking sessions, and on Tuesday I wound up at a project management-themed table with people from all kinds of companies. I don’t want to unmask my secret identity by saying who I sat with, but people I met at various points were from Target, Centene, Oregon Health & Science University, Comcast, MGM Hotels and Resorts, health systems, hospitals, EHR vendors, Microsoft, DocuScan, local school districts, municipalities, Salesforce, and more. It was a great conversation and very gratifying to hear about the way some of these groups were solving the same problems I run into with my clients. Of course, explaining my vague-sounding consulting firm always garnered some interesting looks. 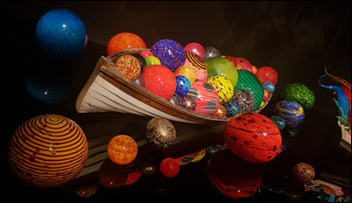 Tuesday’s client event was at the Chihuly Garden, and on the hour-long bus ride (love that rainy rush hour Seattle traffic!) I met some fun people who had some great advice for doing different things with Smartsheet. The event featured not only the glass, but food and drink from various local vendors along with seafood, pasta, and an all-potato buffet with parmesan French fries, tater tots, kettle chips, potato skins, and a baked potato bar. The dessert tables had been picked clean by the time I figured out they were in a separate little greenhouse area, so I missed out on the eclairs. The featured cocktail included moonshine from 2Bar Spirits, but I steered clear. 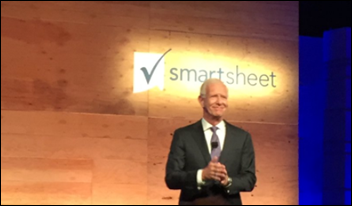 Wednesday’s keynote included a panel of Smartsheet leaders taking audience questions, followed by Captain Chesley "Sully" Sullenberger, who I found riveting and one of the best of the many professional keynote speakers I’ve seen over the years. If you’re looking to be inspired to greater things such as duty, honor, dedication, and service, he’s your man. He had some great insights into how people and technology interact, along with the true nature of innovation – changing before you’re forced to. I do have to say though that watching the recap of Flight 1549’s journey at the beginning of the speech was haunting. I’ve made plenty of life or death decisions in very short timeframes with patients on the table in front of me, but I can’t imagine being in his seat with 155 passengers on board and figuring out a solution that saved everyone. He recounted how hearing the flight attendants shouting "Brace, Brace, Brace" to the passengers functioned in a sort of cheerleading capacity to help him through the situation. He highlighted the performance of his team during the incident and how everything in their careers before that helped prepare them for the situation. One of his statements really resonated with me as he discussed how 208 seconds has come to define his entire career as a pilot. I thought about that several times the rest of the day – if we had three minutes that would define our careers, what would that look like? Overall, I was happy with my choice to attend, although the registration fee plus a couple of nights of Seattle-area hotel rates put a dent in my budget. Smartsheet did a great job with their inaugural client conference and I’m looking forward to seeing things grow. They’ve certainly come a long way from their startup in a little yellow house in Kirkland, WA. After all this… we still don’t know what Smartsheet is. Whoever they are, they have just spent a whole lot of money to provide lavish infotainment. Makes me wonder whether the information imparted was significant at all. Reminds me of Nero fiddling while Rome burned. After North Korea drops their bomb we will all have to get back to more meaningful pursuits.